2 people want to go here. 3 people have been here. 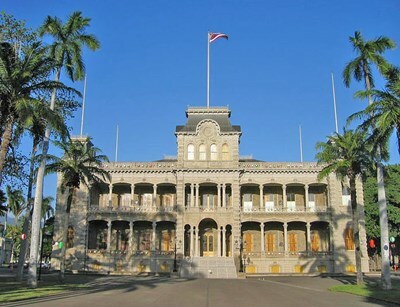 Hawaii is the newest of the 50 U.S. states, and is the only U.S. state made up entirely of islands. It occupies most of an archipelago in the central Pacific Ocean, southwest of the continental United States, southeast of Japan, and northeast of Australia. Hawaii’s natural beauty, warm tropical climate, inviting waters and waves, and active volcanoes make it a popular destination for tourists, surfers, biologists, and volcanologists alike. Pearl Harbor, or Pu'uloa, is a lagoon harbor on the island of Oʻahu, Hawaiʻi, west of Honolulu. Much of the harbor and surrounding lands is a United States Navy deep-water naval base. It is also the headquarters of the U.S. Pacific Fleet. Hawaiʻi Volcanoes National Park, established in 1916, is a United States National Park located in the U.S. State of Hawaiʻi on the island of Hawaiʻi. It displays the results of hundreds of thousands of years of volcanism, migration, and evolution—processes that thrust a bare land from the sea and clothed it with complex and unique ecosystems and a distinct Ancient Hawaiian culture. The USS Arizona Memorial, located at Pearl Harbor in Honolulu, Hawaiʻi, marks the resting place of 1,102 of the 1,177 sailors killed on the USS Arizona during the attack on Pearl Harbor on December 7, 1941 by Japanese imperial forces and commemorates the events of that day. The attack on Pearl Harbor and the island of Oʻahu was the action that led to United States involvement in World War II. The memorial, dedicated in 1962, is visited by more than one million people annually. Hawaii Volcanoes Wilderness is a designated wilderness area within Hawaii Volcanoes National Park on the island of Hawaii in the U.S. state of Hawaii. It was designated in 1978 with 123,100 acres (498 km), and was later expanded to 130,790 acres (529 km). Wilderness designation covers the northwestern extension of the National Park, including Mokuaweoweo, the summit of the volcano Mauna Loa. Maui’s Hookipa Beach has long been a crucible where wind and wave sports are born, refined, and practiced to their perfection. Think Robby Naish, Laird Hamilton. 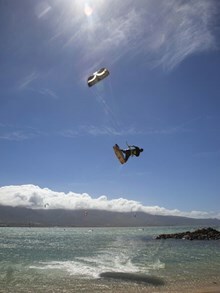 Think tow-out big waves, the explosion of windsurfing, and now the apotheosis of kiteboarding. The crescent of North Shore sand framed by grandstand bluffs gets blessed by 25-knot trade winds and blasted by a powerful reef break that can surge to mast-high or double that when Alaska storms deliver a big north swell." In 2008, Dole Plantation’s giant Pineapple Garden Maze was declared the world’s largest maze. The maze stretches over three acres and includes nearly two and one-half miles of paths crafted from 14,000 colorful Hawaiian plants. Walk through the flora of the islands as you seek out eight secret stations that each lead you closer to the mystery at the heart of this larger-than-life labyrinth, one of only a handful of permanent botanical mazes in America. The Muliwai Trail (also called the Waimanu Valley Trail) is an out and back hike along the northern coast of Hawaii's Big Island. The hike traverses pristine wilderness, connecting Waipio Valley to Waimanu Valley and features black sand beaches, stream crossings, and waterfalls."